Human bodies are gross. We’re all bags of meat and juices that (hopefully) kick around for 90 years and then stop moving. Dead bodies are even grosser. Or at least that’s what I thought before I played A Mortician’s Tale. I tracked down Gabby DaRienzo, one of the designers behind this interesting adventure and tried to figure out what would compel someone to make a game about life’s end. In the past you’ve described Mortician’s Tale as a “death positive game” why did you want to make a game about the ultimate morbid topic? I have a few friends who either currently or previously have worked in the death industry. I’ve always been interested in their work, and knew I wanted to make a game inspired by their experiences, but it wasn’t until after reading Caitlin Doughty’s book Smoke Gets in Your Eyes that I felt inspired to do it. Smoke Gets In Your Eyes is a fascinating and often humorous autobiography where Caitlin talks about her career as a mortician and the history of the western death industry. I was first introduced to the concept of “death positivity” through her book, which sounds like a bizarre term, but really it’s a movement that encourages people to be open to talking about death, and to explore their fears of grief and mortality. It’s not meant to erase feelings of grief or loss, but to instead be open to understanding it, and discussing it. Ultimately being comfortable with talking about death allows us to make informed decisions for both ourselves and our loved ones. I resonate with this idea of “death positivity” a lot, and Caitlin’s story about going from working in a crematorium, to attending funeral direction school, to running her own green funeral home, are what really inspired the story of A Mortician’s Tale. 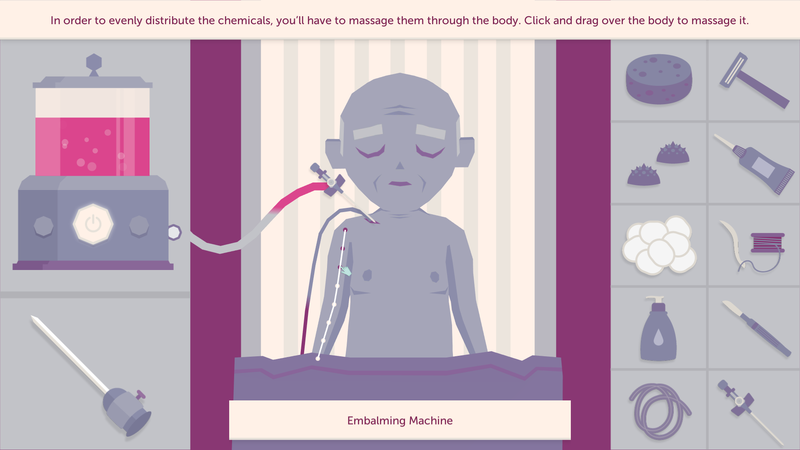 Mortician’s Tale has a really unique aesthetic that seems at odds with the game’s themes of death/dying. Can you go into why that is? 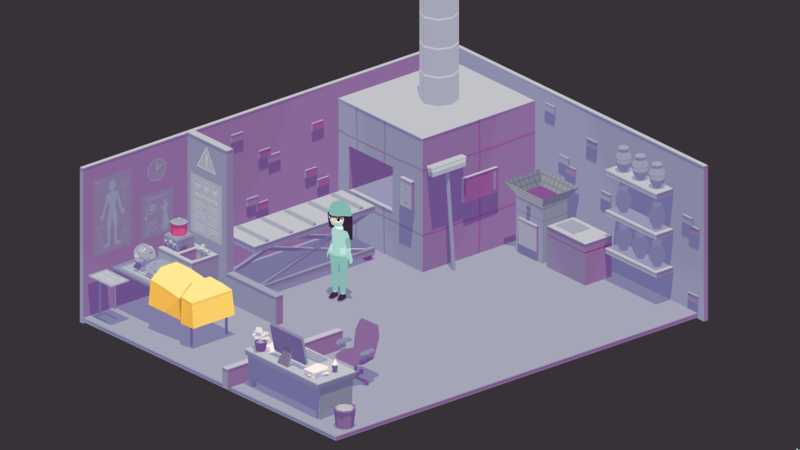 The goal with A Mortician’s Tale is to talk about the subject matter as accurately as possible while also understanding that it is often a sad and uncomfortable topic for many, and to be mindful of presenting it in a way that makes it more approachable for people. The purple aesthetic acts as a way to reinforce the game’s melancholic-yet-hopeful themes while also simultaneously masking some of the grosser aspects of funerary work. The exaggerated proportions on the characters in the game also serve to distance players from any uncanny valley-ness. We tried our best to find this accurate-yet-comfortable balance with a lot of other things in the game — from the art, to the sound effects (created by Jen Costa), to the music (created by Halina Heron) to even the writing (by Kaitlin Tremblay). You’ve been developing Mortician’s Tale for several years now. How has the project changed over the development cycle? I first started developing the game solo, but was fortunately able to bring on a team of people to help me make it thanks to receiving funding from Ontario Arts Council. The game subsequently grew to become a lot larger, and in my opinion a lot better. Each and every person on my team not only brought their own talents to the game, but their own individual stories and experiences with grief and loss — the game is just as much theirs as it is mine, and it’s a lot deeper, a lot sadder, and a lot more personal because of it. Another big change was the design of the game. Initially I had designed the game so that every individual body had a specific procedure you had to do for it — whether it was de-bloating a drowned body, or reassembling a disfigured one. The game felt especially morbid, and not at all interesting. I was so inspired by Caitlin Doughty and my other mortician friends’ stories, and was much more interested in the narratives behind the deaths they experienced, and the stories about the funeral homes they worked at, and ultimately I decided to change the game to put a greater emphasis on those stories instead. Do you have anything you’d like to say to the people who are interested in the game but get a bit uncomfortable with its subject matter? Although we’ve taken steps to make it more approachable, the game and its subject matter will always be uncomfortable. I will say that immersing myself into that uncomfortable territory has encouraged me to learn a lot more about the death industry, and has allowed me to have some important conversations with my loved ones about what I want and what they want for themselves when we inevitably each die. That sounds morbid, but it is so so important. When I lost my mom earlier this year to breast cancer, we were able to make medical decisions for her when she couldn’t make them for herself, and give her a funeral she wanted. I’m so grateful to have been comfortable and educated about the subject matter enough to talk about it with my mom ahead of time, and give her her ideal death, and by playing through this uncomfortable game, that’s something I hope we can also give to our players and their loved ones too.